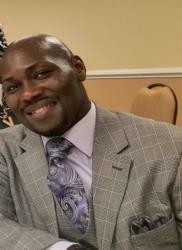 Mr. Darin Dwayne Harvey passed September 9, 2018. Private Interment. Haugabrooks Funeral Home. It is with great sadness that the family of Darrin Dwayne Harvey announces his passing after a year-long battle with cancer, on Sunday, September 9, 2018, at the age of 41 years. Darrin will be lovingly remembered by his mother, Regina Harvey. Darrin will also be fondly remembered by his sister, Chiffon Harvey and brother, Terrence Colbert (Tar’Kesa); his loving grandmother, Nancy Perkins, aunt,Patrice Harvey; uncle, Aaron Harvey; five loving cousins, Damion Harvey (Denise), Knoll Mathews, and Aaron Harvey Jr.; 2 great-aunts, Kathleen Griffin & Beverly Jo Kosoko. Darrin will also be forever remembered by a host of exceptional family members and friends. Darrin was preceded in death by his brother, Michael Terrence Harvey, and grandfather, Homer Lee Harvey. Memorial services will be held at 11:00 a.m. on Friday, September 21, 2018, at 123 Wesson Street Pontiac, Michigan with the Rev. John D. Tolbert of Trinity Missionary Baptist Church, officiating. A second memorial for Darrin will be held for his friends in Atlanta on Sunday, September 30, 2018, at 5315 Brookhollow Dr, Douglasville, GA 30135-2096 at 2 p.m.
My deepest sympathies to the Harvey family. I am very sorry for your loss. I know that your family is mourning the loss of a dear loved one. This indeed is a very painful time. Please accept my sympathies. Rest assured that our loving God, Jehovah is certainly aware of how you're feeling. In His Word, the Bible, he promises to raise up our dear loved ones through the beautiful hope of a resurrection. (Acts 24:15) May "the God of comfort" give you the strength to get through the days ahead. (2 Corinthians 1:3,4) If you would like to know more about the hope your dear loved ones have, feel free to visit jw.org. I’m actually just hearing about my friend’s passing today and I’m floored. Darrin and I worked at CDC together and would sit around and talk and laugh every single morning before we actually did any work. He was one of the most genuine and funniest people I know and I miss him so much already. My deepest condolences to his family and friends. Darrin, I love you forever! My deepest condolences to the Harvey family. Darrin and I were grew up together and we were in the same class from 4th grade through a few college classess. You will truly be missed. I offer my deepest condolences to the Harvey family on the passing of your loved one. Please take hope in Jehovah God’s promise of a resurrection, located at Revelations 21:3,4. I pray that this scripture brings a measure of comfort to you during your time of bereavement.